It's no big secret that eggs are one of the most nutritious superfoods, fat-burning and muscle building. The more you familiarize yourself with updated research, the more you'll understand what I'm talking about. The question is, which do you choose? 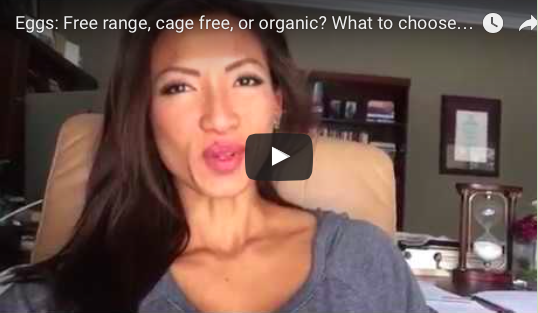 Free-run, free-range, cage free or organic? If you're eating lots of eggs, and you're not choosing the right kind, you're wasting your time. Which one is the "happy hen"? Meaning, which one is the most humanely raised and healthiest kind for you? Here's your 60-second answer. People always ask me for ideas on breakfast. They're either looking for something that tastes good, keeps them full, yet "slimming", give them energy, help them lean up, get their nutrients, or they're just bored of the usual toast, oatmeal, cereals, eggs, smoothies, and other "breakfast-type stuff." Here's a quick summary of my answer. What is more important? Nutrition or Exercise? Don't let all your hard-earned workouts go to waste. Nutrition is KEY as part of a healthy lifestyle and achieving results. It's mainly about eating right (and getting rest) in order to build, repair and maintain a body you want. Don't get me wrong, I love indulging in all my favorite "fun" foods, but I also make sure that I know when to offset my "badness" with a whole lot more of "goodness”. 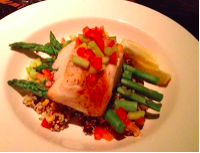 One of my many favorite meals to fuel up with is fish, veggie and good carbs, such as this halibut and asparagus, on a bed of quinoa (below). What are you fuelling up on? I find that most people think that pasta is "bad for you." 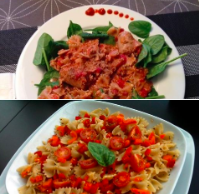 Let me clarify: It is NOT the pasta that is bad for you, but it is how you prepare it and how much you consume at a time that can make it bad. Also, most fail to eat their veggies when having pasta, which leads to a nutritionally-imbalanced meal. Allow me to explain. Click here. Is there a right way to eat steak? I love steaks, especially T-bone steaks. Though steaks (especially leaner cuts and grass fed ones) can be good for you in terms of providing a ton of necessary nutrients such as protein, selenium, vitamin B12, and zinc, it is not the healthiest if consumed too frequently (for reasons ranging from too much uric acid to high cholesterol). So with that, I limit my intake to once or twice a week. This is enough to really enjoy it and take in all the good stuff it has to offer, but not so much as to compromise my health. The side dishes you pair with your steak are very important in order to aid with better digestion and to neutralize the acidity. A nice big green salad is best; something highly alkaline and nothing too heavy. Or, in this case I didn't do a salad, but I did, however, stay consistent to my standard of eating nutritious foods that are colorful and vibrant! I added sautéed mushrooms, lots of mixed veggies, and no more than half cup basmati rice (mixed with turmeric for more health-added benefits). 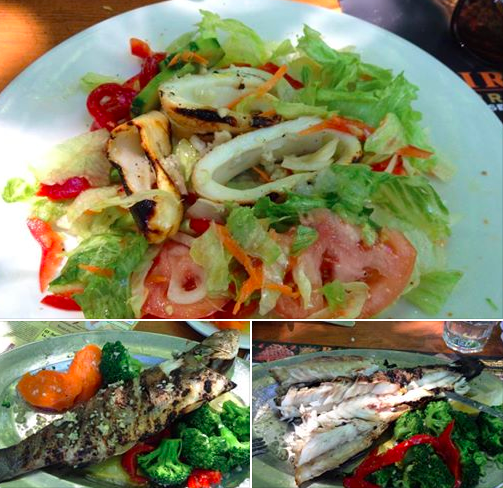 I love adding fish to my salads for added flavor, as well as, added substance. 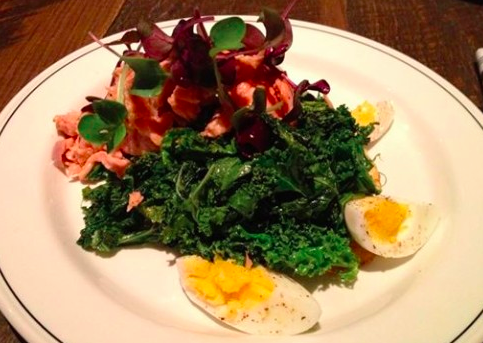 Here is a trout on kale salad (with an egg and a few olives just because). What a deliciously nutritious, slimming and filling meal. In one shot, you get your protein, good fats and fiber, plus vitamins and minerals! All the ingredients to help you stay lean, while providing your body with quality energy and assisting in recovery from day-to-day activities, and/or workouts! The more colorful and/or vibrant it looks, chances are, it’s filled with nutrients. And by the way, this does not include foods like colorful cakes, candies, cookies, cereals, etc. I'm talking about real foods with substance such as quality protein, grains, produce, whole foods. For me, last night's dinner was a Malaysian-style satay chicken lightly sprinkled with peanuts and topped with a refreshing mango salsa, accompanied with some basmati rice with turmeric, and a whole lot of mixed greens. In preparation for the final weeks of a Natural Bodybuilding Fitness Competition, one of my staple meals is baked chicken breast, steamed broccoli and mashed sweet potatoes. Protein shakes and snacking on rice cakes with a little organic peanut butter and jam. 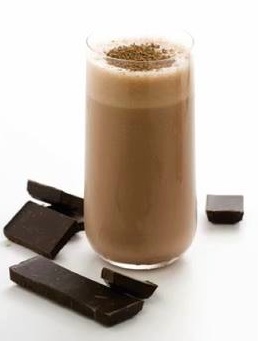 Your healthy protein shakes can taste like dessert! I challenge you to rid of your cheat treats and eat nutritiously clean and lean for the next few weeks. Here are some ideas of meals. Baked, boiled, steamed or grilled. Seasoned or flavored with herbs or spices, olive oil, garlic, lemon, light sprinkle sea salt or light soya sauce. Nothing heavy. 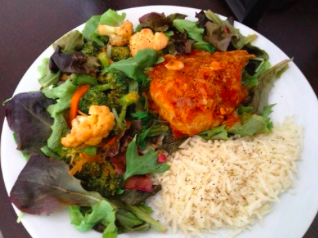 Keep in mind, food portion will vary person to person depending on your health and fitness goals. 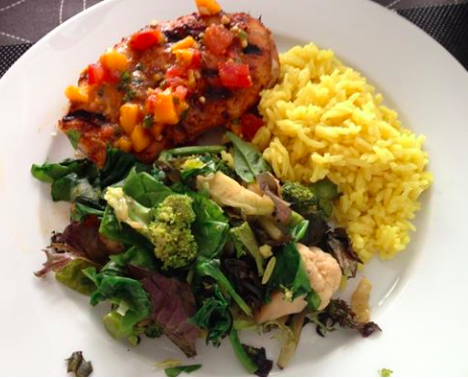 The meals I share here are just to give you an idea on eating well. - chicken breast and veggies (broccoli, peppers), sometimes adding avocado. - halibut and veggies, sometimes adding a small potato. - salmon with kale or spinach salad, sometimes adding sweet potato. - couple times a week I switch to red meat such as extra lean pork or beef tenderloin with veggies, sometimes adding a little brown rice or quinoa. On my low activity rest days I aim to have little to no heavy, starchy carbs other than my usual oatmeal and/or toast earlier in the day. With that, I make sure to get my energy source (calories which I need to efficiently get through the day) by having more protein, good fats, and greens. To ensure you always have a good meal ready to go, it helps to plan and prepare in advance. For example, instead of baking one piece of chicken breast, you want to bake 4-5 pieces to last you several meals. Prepare your veggies and rice in advance. This way, grabbing a good meal on the go can be simple, healthy and delicious. 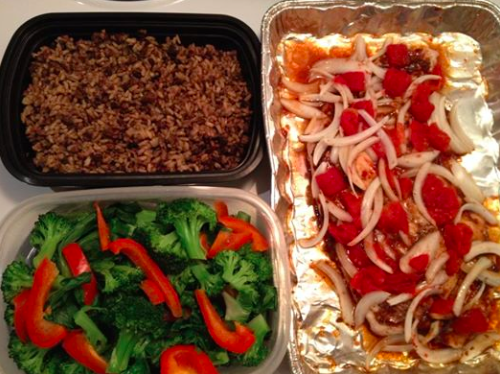 You can always have a delicious and nutritious meal ready to go, without a lot of work. Let me show you how! Click here. 5 weeks out from my fitness competition and I like to completely change things up over the weekend and/or in the mid-week for the sake of variety and maintaining overall mental, physical and emotional balance. Instead of my usual protein source of chicken breast, salmon or tuna, I might do other sources of protein altogether such as shrimp, lobster, white fish (sea bass or halibut), steak or pork tenderloin. I might even indulge in different kinds of starchy carbs preparing it as clean as possible without losing flavor, and consuming it in moderate portions. Between 6am - noon, I would have half cup cooked oatmeal with a splash of almond milk, and a small wedge of cantaloupe. Then, a protein shake (one scoop of iso whey protein powder) and handful of blackberries. I usually have this after a workout, adding natural glutamine and BCAA (branch chain amino acid) to help with muscle energy, recovery, maintenance and development. And second breakfast is usually scrambled egg whites with chopped up veggies such as broccoli and/or red peppers. All this adds up to a total of approximately 500 calories. 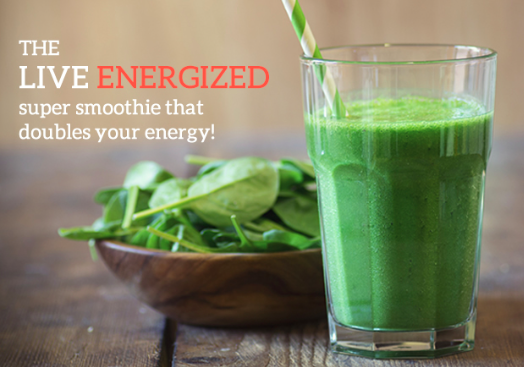 Filling, nutrient-rich, health-promoting, energy-providing calories! 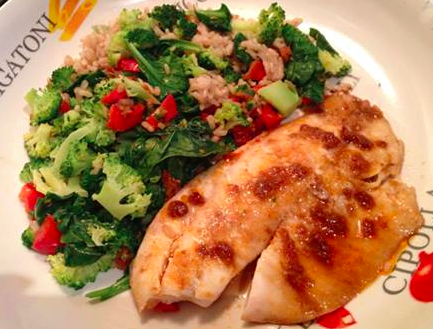 Changing up my protein to baked whitefish (in this case it's tilapia). Lightly seasoned with coconut oil and my favorite Malaysian chili paste. Accompanied with mixed veggies of broccoli, spinach, peppers, tossed up with a little bit of brown rice for flavor and texture. This meal is low carb, high protein, and a great source of good fats, fiber, vitamins and minerals. 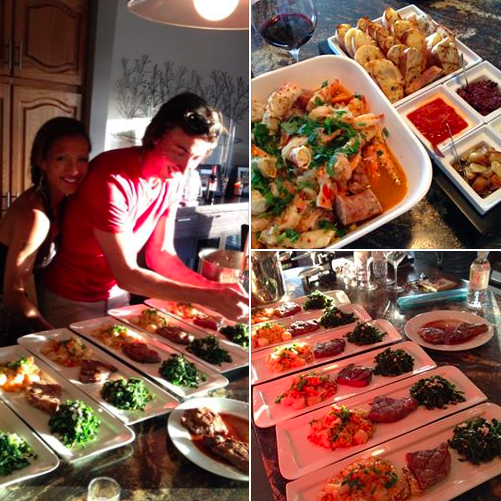 Even when we entertain, we keep the main meal balanced and well-portioned for our guests so everyone walks away feeling more than satisfied. 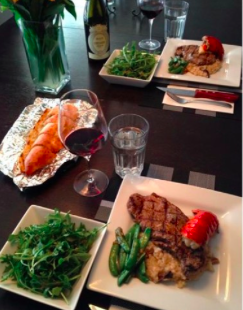 Kale salad, grilled New York steak, seafood risotto. Delicious! At this point under 8 weeks out from competition day, I’m down to a few staple breakfasts, keeping it simple, clean and lean; and strategically fuelling my body for the day’s activities and physical demands. Because I usually have long days waking up at 6am, I have 2-3 small breakfasts by the time noon rolls around. Because I strive to be efficient with my time, I always find ways to get things done quicker without compromising quality. 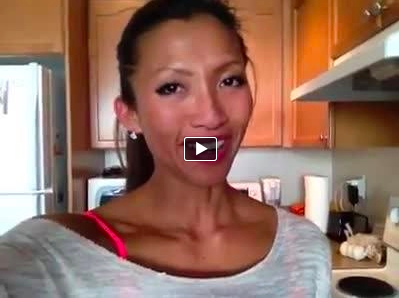 Here’s how I get my fit and healthy breakfasts ready in less than 3 minutes. Click here and check it out. Changing up my macronutrients last night. Instead of chicken breast or fish for dinner, I had lean pork loin done Greek style with oregano and lime, mixed vegetables Asian stir-fry, little bit of brown rice and grilled sweet potatoes (roughly adding up to three-quarter cup of good carbs) fueling me for my back workout today. Clean, lean and simple. And still super tasty! One of my few staple meals is chicken breast baked with little bit of coconut oil, light sprinkle of Cajun spice, few dashes of light soya sauce (or sea salt), chili powder and pepper. Half cup cooked brown rice to fuel me further for a long day, and 2 cups of mixed broccoli and spinach with peppers, steamed (or warmed till soft with a little crunch), adding a little olive oil and a small amount of Asian chili paste because I love the spicy flavor. Getting good fats in your body is extremely important for energy, and heart and brain function. Because salmon is already flavorful enough on its own, you don’t need to dress it up too much - which is a bonus! No need to add unnecessary calories or sodium. Just add a little extra virgin olive oil, pinch of sea salt, pepper, and fresh squeezed lemon. Add veggies (as much as you want), and some quinoa or other quality grains (half cup cooked). And voila! 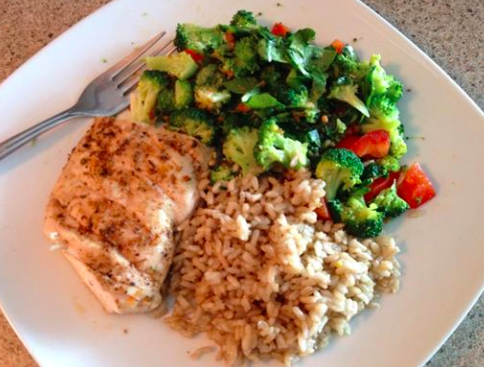 Clean, balance, healthy, simple and delicious meal. Yes, sugar from fruits may be considered a better kind of sugar to consume, but too much sugar is still too much sugar and could cause havoc to the functional efficiency of your body, especially if you have health issues, are trying to lose weight or just wanting to lean up. In those cases, consider not consuming too much sugar. Opting for lower sugar fruits would be a good place to start. I personally love berries! Not sure what fruits to choose to assist you with your health or fitness goals? Check out this link here to see the nutritional value of each fruit. You may be surprised to find out where your favorite fruit sits on the chart compared to other fruits! It is exactly 12 weeks out from competition day. Had a celebration cheat dinner last night of thin crust pizza and pasta at my favorite Italian restaurant (wine, port and dessert, too). Started clean today with a fresh grilled halibut with vegetables (broccoli, carrots, peppers) and a small potato. With a busy schedule it's easy to eat the wrongs foods and/or eat the wrong portions to achieve your health and fitness goals. This is why for your regular meals, it pays to prepare them in advance so you don't run out of the right kinds of food and/or make any excuses about having no time. Here I prepped enough food to last me 4 meals consisting of mixed veggies, quinoa and lentil blend, baked turkey breast with onions and tomatoes. By the time I'm through with these 4 meals I will have prepared my next batch of food. For the sake of variety, I might change it up to salmon, asparagus and sweet potatoes. For competition prep, and more importantly, just for everyday convenience, learn to save time by preparing most things in advance. This way, you can free up a lot of time to get everything else done in your day while still ensuring you and your family are eating well and not just resorting to whatever unhealthy options available. Things like vegetables for example, can be prepared well in advance to last you several meals so you can just grab and go, or just pull out and warm up for family meals. Add your carbs or good fats and protein, and you've got your balanced meal! No need to do multiple grocery trips or perform any unnecessary repetitive steps when preparing your meals. Watch it here. 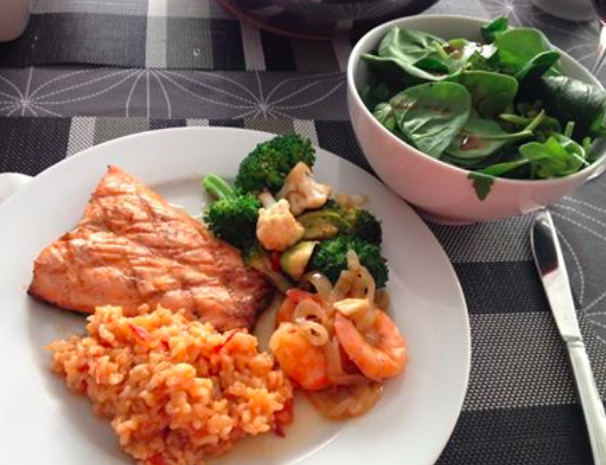 A healthy, leaning meal can be simple and delicious! 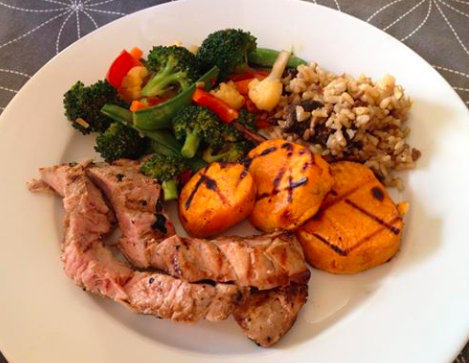 A tasty, healthy "Good Friday" dinner, in line with my fitness competition preparation. 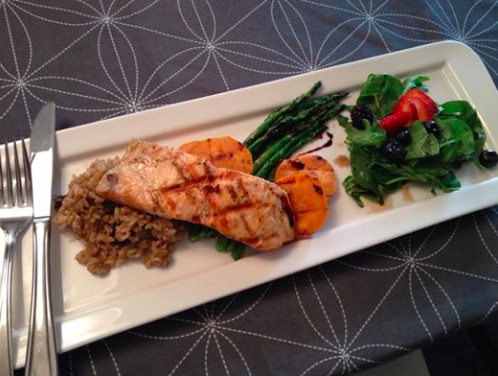 Brown rice with mushroom, salmon, sweet potato, asparagus, and spinach salad. Healthy ingredients and everything made clean with olive oil, sea salt, pepper, balsamic glaze for flavor. Everything good that the body can use. And it tastes amazing! Goes to show, you don't need fried, sauced up, creamy, or over-sodium food to enjoy a meal. What to eat to fuel for an intenseleg workout? Also, the portions and foods can vary from person to person depending on what your goals are and how your body is responding. For me, I continue to be deliberate with what and how much I eat so my day-to-day is not exactly the same and very much depends on my activity level. Do I need to add more carbs today for all that running around? Should I eat super clean to make up for my cheat day? Or do I have to fuel up properly for my next workout? These are some of the many things I keep in mind when prepping my meal. Watch it here. What's for breakfast on a rest day? It's exactly 14 weeks from competition day! Not working out today. I choose to rest and hang with my family. I'm mindful we're taking the kids out for a fancy dinner of pasta and pizza tonight so I'm going to keep my daytime food light and clean while eating my nutrients for muscle maintenance and development. I'll skip oatmeal this morning and opt for scrambled eggs with broccoli. I usually put red peppers for tons of vitamin C (but didn't have any today). Best breakfast is one filled with protein and fiber. Watch it here. Why do some people eat their hearts out, workout minimally (2x per week), and still look and feel great? It’s because they know how to “fuel” their bodies with the right foods. Allow me to explain. One very leaning and delicious way to eat a wrap is to make a lettuce wrap. 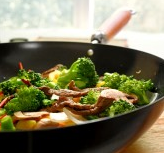 Stir-fry your favourite nutritious ingredients and lay it on lettuce to wrap. Here, I have a concoction of minced lean pork and shrimp, chopped bell peppers, garlic, onions, celery, mint and cilantro all stir-fry together with light soya sauce and pepper. Not all burgers are made equal. If you're going to have a burger, why not choose the Wendy's junior cheese burger (on the left) at 350 calories, 19g of fat, instead of the Ruby's bacon cheese burger on the right at a whooping 1759 calories, 105g of fat. Wow! That's a whole lot of unnecessary calories, fat, sodium, grease...you get the picture! When I say I'm going to have a "clean" meal, it doesn't mean I'm going to eat very little. It means I'm going to eat a lot, but A LOT of good stuff that my body can use. My meal is huge, but the calories are low and clean...this means no greasy, creamy or processed stuff. And not sauced up with sodium or sugar. Here are a few delicious examples. Question for Penny: What would be the best way to eat to maintain a healthy weight and boost energy? Read answer here. 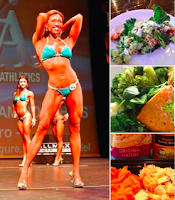 Here are some of my superfoods to build and maintain a lean, fit, healthy body: eggs, oatmeal, berries, almond, tuna, salmon, chicken or turkey breast, asparagus, broccoli, spinach, bell papers, avocado, tomatoes, brown rice, sweet potatoes. Your regular workout regime can’t fully serve you if you don’t pair it up with nutritious meals. Here are some simple meal ideas including the superfoods to ensure you’re eating deliciously well on your journey to getting super healthy and fit. Check it out. The 9 most cleansing alkaline foods to detoxify your body and give you loads of energy: Avocado, cabbage, kale, cucumber, spinach, broccoli, celery, ginger, garlic. Find out why and more. To lean up real good before a photo shoot, fitness show or a feature appearance, I certainly lower my starchy carb intake and increase my protein and greens. Like I always say to my clients, "Protein and green equals LEAN." It rhymes for a reason. Burgers can be healthy and good for you depending on how you make it! 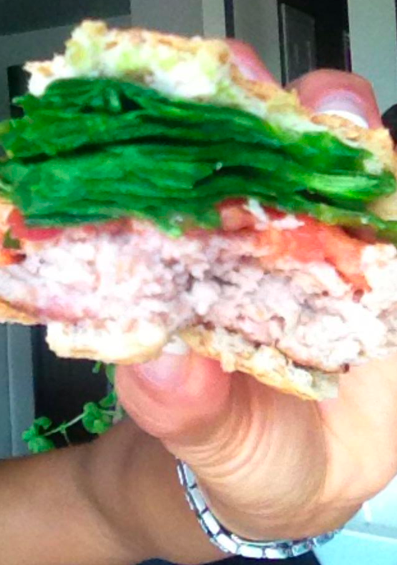 Here's how my burger looks today: Ground turkey patty, tomatoes, TONS of greens (lol), thin crust bread, or in this case, whole wheat kaiser bun (and I felt like pulling the extra dough out so it's not too doughy or bread-heavy). Minimal sauce. In this case, I put some ketchup and some good old chili sauce. I like it a little sweet and spicy! What the heck does that mean anyway? Well, generally, what that means is that you should enjoy your foods to FUEL up, NOT to fill up! To give you an idea, allow me to share with you a quick video of the lunch I'm making today...but keep this in mind… Read more and watch video here. This tasty, easy-to-make-drink can be used to treat many conditions. What’s in it? Find out how it’s done and how it can help. Click here. Had a BIG bad food day yesterday… burgers, fries, chicken wings, you name it! Time to clean it up today! Having one of my extremely nutritious, delicious and cleansing drinks made with only some of the world's healthiest ingredients. Get all the details on this, including ideas on clean, lean and delicious meal combos to help you look and feel great. Click here. Here are some simple meal ideas to ensure you’re eating deliciously well on your journey to getting super healthy and fit. Check it out! Don't be concern with others. Just adopt the things that work for you, and let go the things that don't. Try and keep it simple when making health and fitness goals. For me, I choose to have a body composition that keeps me healthy and happy — one where I can truly enjoy life without feeling deprived in any way. Click here to see photo and caption. Baked Kale Chips! A tasty, healthy alternative to potato chips! Kale is so good for you in every way, so to be able to make them into chips is such a bonus! Not all ovens are the same so you must adjust the low heat accordingly so the kale can turn crispy with a slight brown toasty edge. Keep your eye on it so it won’t burn. For me, it was 250 degrees for roughly 45 minutes. At the 35 minute mark, I started keeping my eye on it and pinching it a little to see if it was crunchy yet. Yum!! You can throw this together in under five minutes. Living alkaline is A LOT easier than you think. 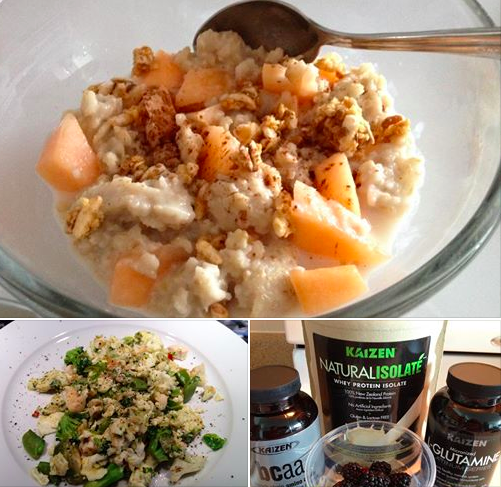 If you want to seriously lose weight, get more energy and feel vibrant and alive - eat like this! 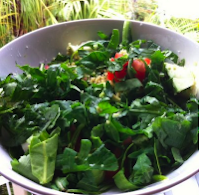 Lemon, parsley and coriander, cous-cous with avocado, rocket, spinach, kale with flax oil and lemon dressing. Note: the cous cous served is very small — when you eat alkaline, make this type of ingredient the smallest on the plate. 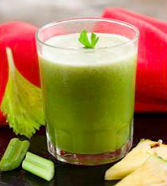 — Courtesy of my friends at Energize for Life: The Alkaline Diet Experts. Check them out here to learn more and energize your life! Here's an easy-to-make healthy, low-calorie Summertime Frittata with nutrient-rich toppings of artichoke, tomato and basil pesto. Click here to get healthy omelet recipes and healthy frittata recipes. 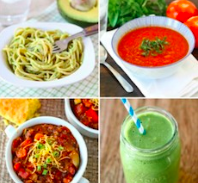 If you love food like I do and you’re wondering how you could prepare meals that are delicious, yet nutritious and diet-friendly, here are 29 great recipes heavy on good-for-you-ingredients—and light on calories and fat. One for everyday of the month! Nutritional Facts are displayed at the bottom of the recipes if you’re counting calories. ;) Enjoy now! Boneless, skinless chicken breasts have consistently been at the top of the list of lean proteins for fat loss. In addition to being a fat-burning powerhouse, chicken breasts nutrition facts provide a wealth of health benefits to help you maintain good health. Roasted, broiled, grilled or poached, and combined with a wide range of herbs and spices, chicken makes a delicious, flavorful and nutritious meal – a healthy alternative to red meat. So if you love chicken, how do you keep your chicken dishes healthy, exciting and new? We’ve got your answers here and more. 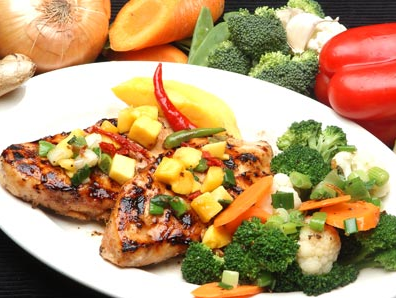 Check out these exciting chicken recipes that will make your mouth water! Garlic is packed with powerful phytochemicals Allicin and Diallyl Sulfides which have been linked to lowering blood cholesterol, reducing the risk of stomach and colon cancers. The phytochemicals are released when the garlic is crushed, chopped to cooked. Studies have shown that eating 2-3 cloves/day can significantly lower risk of colon cancer and provide heart health benefits. According to the Journal of the Royal College of Physicians garlic not only lowered bad cholesterol (LDL) by 10% but it also increased the good cholesterol (HDL) by up to 17%. In the same study garlic lowered triglycerides (blood fat) by up to 17%. So don't worry about smelling like garlic even if you have to kiss; you can always plan around that. Just think: you have one life to live, but a whole life to kiss. So garlic up! ;) Try some of these new and delicious garlic recipe dishes today! I love broccoli! It is a heart-friendly food. 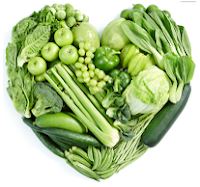 The beta-carotene, potassium and folate all promote a healthy heart function and are known to reduce the risk of heart disease. Broccoli is also famous for its cancer-fighting contents including flavonoids, terpenes, and phenolics. Sulforaphane, one of the cancer-preventing compounds, boosts the body's defence against tumours and protects against many different types of cancers. Another special compound luetin is especially potent in reducing heart disease by eating away at plaque build up on artery walls. Furthermore, broccoli is another bone building vegetable containing over 100% of your recommended daily intake of vitamin K and 200% of your recommended daily intake of vitamin C.
Asparagus is a great vegetable for people who are physically active. It is high in vitamin K content which is important for chelating calcium to help build strong bones and prevent osteoporosis.. In addition, it supplies almost 66% of the daily recommended intake of folate, which is crucial for red blood cell synthesis and preventing iron deficiency anemia. Asparagus also contains a special kind of carbohydrate called inulin that promotes the formation of a health-friendly bacteria in our large intestine. Here are some tasty asparagus recipes that will keep you coming back for more. 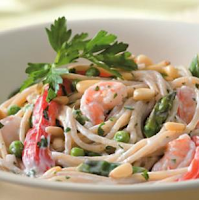 Click on the recipe links on this page to get the delicious, healthy ideas — courtesy of Best Health Mag.ca. Why these foods work best paired together. How you pair your foods can enhance the way your body absorbs and utilizes the nutrients. Find out why spinach goes well with strawberries, tomatoes go well with olive oil, salsa with guacamole, and beef with broccoli. Read more here and get meal ideas on delicious food combinations that will make eating well fun, yummy and healthy! Understand how it works and you may just get some great meal ideas of your own. Click here. Do what Tila does and stay healthy and fit: workout in the morning (even if it's a short 10-minute aerobic exercise, it can help speed up your metabolism and boost your energy level), and add blueberries to your breakfast. 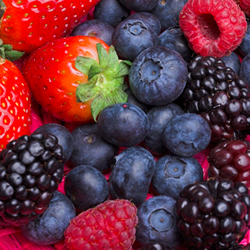 You’ll be amazed at what these mighty little berries can do for you. 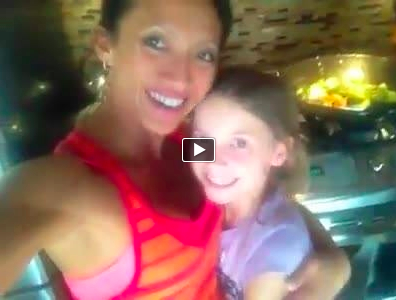 Read the full benefits, get the best blueberry recipes and watch Tila’s video. Click here. Want to learn more about cleansing? Understand what it means to cleanse, and find out how natural food combinations can help. Click here. If you’re going to cheat, cheat smart! 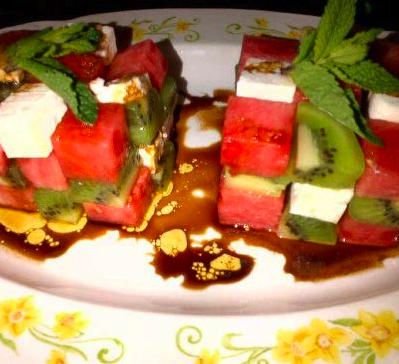 I admit, I have a sweet tooth and I love desserts!! But I also know there are always ways to make a healthier, better version of something you enjoy eating. So you can indulge guilt-free and gym-free! 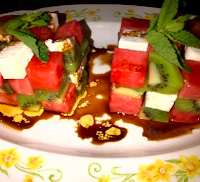 Allow me to share one of my favorite desserts with you. 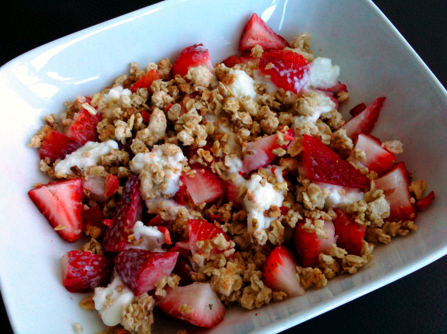 It takes 2 minutes to whip together; it's nutritious, healthy, and perfectly SWEET and a little crunchy! All under 200 calories. Check out my special “DeLight”. Click here. I know most of you have busy schedules and so you may say you don't have time to prepare your meals—let alone prepare deliciously healthy, balanced meals to last for weeks. Well, all I can say is, that's a terrible excuse! If you really care about your (and your family's) well-being, you would take a moment to look into the "what-to-do" and the "how-to-do". And when you do, you would realize the many options out there that can make a huge difference to your life, and your health and fitness goals. Allow me to start you off with this simple suggestion. It's like having your own private chef cooking away while you go about your day! How convenient! :) Click here. Why tuna? Why cucumbers? Find out all the why's and how's, and get linked to more ideas on tasty, easy-to-make, good-for-you snacks that will tied you over between meals. Click here. Here's a delicious, healthy tomato snack you can also have as a light meal. Aside from its obvious yumminess, it is also less than 200 calories, nutritious, easy to make and will keep you satiated. Read more on the health benefits of this tasty snack and find out how it's done. Click here. Healthy homemade sweet potato fries. Taste so yummy…and oh so good for you, too! These are so tasty you won’t believe you’re eating healthy! You may think nothing this good for you should taste so good...or be this easy to cook. But think again! Rich source of flavonoid anti-oxidants, vitamins, minerals, and dietary fiber that are essential for optimal health. Low in calories, zero fat, zero cholesterol! Find out how it's done. Click here. Who says you can't make veggies yummy and exciting? Get all the nutritious vitamins, mineral and antioxidants from greens such as spinach and broccoli, add nature's super awesome herbs and spices, add some eggs… and boom! You’ve got yourself a tasty omelet. 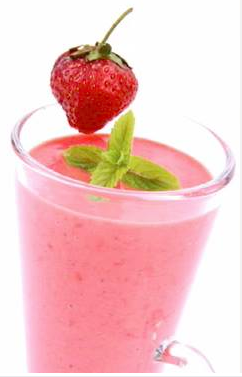 Here's a "200 Calories of Healthy Yumminess" that will keep you satiated. Find out how it's done. Click here. This iconic breakfast staple remains one of the best options for a morning repast. (You can also eat it any time of day!) It keeps you full so you don't binge, helps lower bad cholesterol reducing the risk of heart disease, reduces the risk of type-2 diabetes, increases your body's fat-burning capabilities, and it's a good source of fiber, protein, complex carb and iron; and it tastes great, especially when all dressed up with good stuff! Read more and get more ideas on this. Click here. There is a “window of time” that exists right after your workout during which your body is at its peak efficiency in metabolizing what you consume—its glucose and glycogen stores (energy) are depleted and it is starving to be replenished and will quickly absorb anything good, or bad, that you feed it. And so it's extremely important to learn what to consume after a workout and why. Click here. Prepped a client's meal: Rotini pasta in spicy tomato sauce, mixed vegetables and wild salmon. Easy to make, delicious, nutritious and filling. All for only 500 calories. Learn more about this 500 calories of healthy yumminess and get quick tips on healthy weight loss. Click here.